Make a grand entrance with a bespoke solid oak staircase, or modern chunky treads with glass balustrades. Whether it's for a renovation project, loft conversion or even a fire escape we can help. We are experts in traditional Georgian winding stair-cases with ornate newel posts. 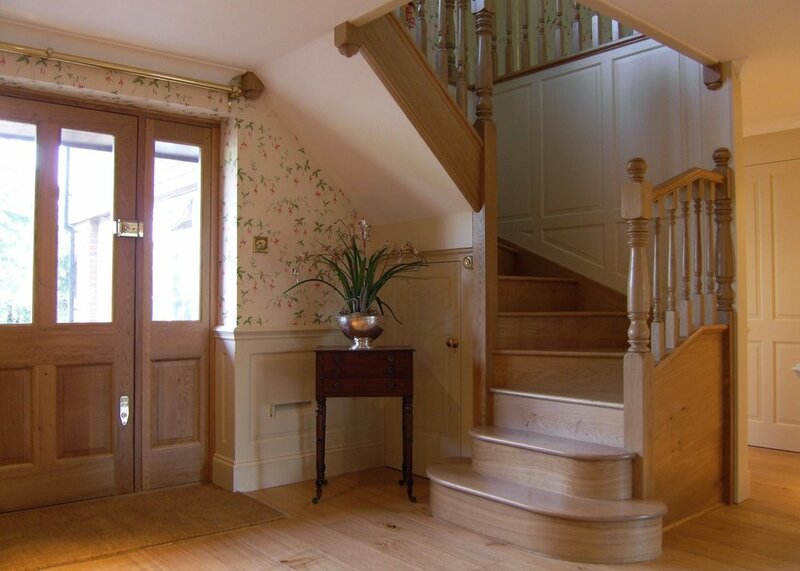 We can renovate existing staircases with new spindles, treads and newel posts. We can also build and install a new staircase for an extension or new-build project inline with current building regulations. The first step is to arrange a site meeting, where we can get an idea of what is possible and get some drawings put together. We'll look at the space and work out what will / won't work, we can work with ideas you have in mind or help you design something from scratch. As part of the initial stages of design, we create scaled architectural drawings to understand how the piece will look once built. Together we can make changes to improve on the design. We'll advise you on materials and finishes, depending on your style and budget. From solid wood varnishes finish or soft wood with carpeted treads, to ornate knewel posts or modern glass and metal railings. When possible we pre-build large sections of the staircase offsite to speed up the installation process.